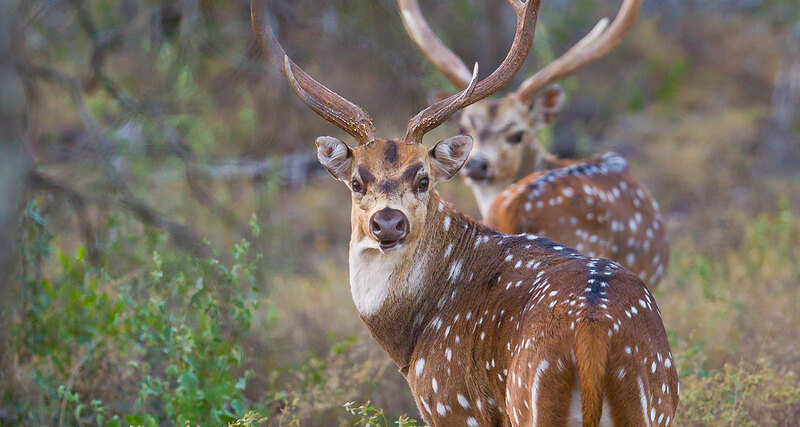 The chital is listed by the IUCN as being of least concern “because it occurs over a very wide range within which there are many large populations”. Currently, no range-wide threats to chitals are present, and they live in many protected areas. However, population densities are below ecological carrying capacity in many places due to hunting and competition with domestic livestock. Hunting for the deer’s meat has caused substantial declines and local extinctions. The axis deer is protected under Schedule III of the Indian Wildlife Protection Act (1972) and under the Wildlife (Preservation) (Amendment) Act, 1974 of Bangladesh. Two primary reasons for its good conservation status are its legal protection as a species and a network of functioning protected areas. The chital has been introduced to Andaman Islands, Australia, Mexico, Chile, Argentina, Uruguay, Brazil, Paraguay, Point Reyes National Seashore near San Francisco, California, Texas, Florida, Mississippi, Alabama, and Hawaii in the United States, and to the Veliki Brijun Island in the Brijuni Archipelago of the Istrian Peninsula in Croatia.